There’s an incorrect perception among the Metal fans, even of those who study the history of the genre: that Metalcore was an evolution of Melodic Death Metal. No, it makes no sense, because it’s closer to North American modern Metal genres as New Metal, and bears a great influence from earlier Groove/Thrash Metal. 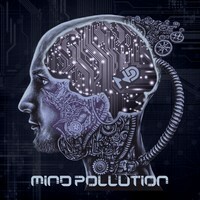 But although Metalcore was born in the USA, it gained the world, and from Italy, a very good name representing of the genre: NEW DISORDER that comes with “Mind Polution”, their latest release. It’s a solid and melodic form of Metalcore, bearing very good modern energy, but not as abrasive as some modern names, because they prefer to use clearer and defined instrumental tunes, and this aspect makes their melodies more evident (without tearing apart the weight and/or their aggressiveness). It’s nothing new in terms of Metalcore, but it has a fresh energy and a musical personality pulses on their songs. On the sound quality: it’s truly excellent. Yes, they have done something that can bind together all their musical elements in a form that flows heavy, modern, clean and aggressive with the right instrumental tunes. Yes, it’s pretty good, and the listener will have a great time due this very good work. The modern and brutal “Riot” (with a very good groove permeating the song, and very good vocals with clean and harsh tunes contrasting harmonically), “News from Hell” (that bears the same elements from the previous one, being a bit more melodic), the tender and charming “W.T.F. (Spreading Hate)” (the contrast between aggressive parts with Progressive moment is brilliant, with very good guitar riffs filling all the spaces), the catchy melodies of “Room with a View” (this one is near what Finnish Melodic Death Metal presents in some guitar parts), and the charming accessibility of “The Beast” are the finest moments of this album, but “Mind Pollution” deserves to be heard entirely, from its beginning to its end. Be prepared for their assault, because NEW DISORDER is not kidding!